Members of nationalist organisations march with torches in the centre of Sofia on February 13, 2017. NurPhoto/ Press Association. All rights reserved.Facts will not save the youth from Fake. This provocative statement does not apply to all young people today, yet it is largely valid for the increasing number of populist youth. “We have no need of your politics of youth, youth is our politics. Among us, youth command youth. We are comrades, friends, brothers, a clan. More than a youth movement, we are the youth itself in movement” The Manifesto of the French Les Identitaires illustrates the systemic affinities between youth and radical populism. The world of populist youth is not populated by the opposition facts vs. fake, but in a different manner which we must understand before we can communicate with it. Paradoxically, a mistrust of facts seems a healthy attitude towards the authors of the simulacrum that has replaced the world. This different world is apparently attractive, because – even before Trump – it has been enticing a growing number of young people, both inside the fragile post-communist democracies, where I come from, and the more consolidated but also “wearier” western (post-) democracies. Post-democratic populism and youth have been actively reinforcing each other. Max Weber once said that myth and facts, despite their status as antonyms, can play the same role – of unifying a community. He reflected on the origin of ethnic communities, comparing their factual historical origin with the myths about it. If people strongly believe in the symbolic mythological narratives, these narratives serve to consolidate the groups in the same manner. Astute strategists have transformed Weber’s insightful idea into political engineering, and charismatic leaders have catalyzed the transition from facts to identities, from arguments to affinities, from critical thinking to belonging. I will reconstruct this world through the lens of youth, structuring it around three poles: post-democracy and post-truth as an empty shell; aestheticized identities, untouchable by facts; rhizomatic networks as a self-checking mechanism. Facts have not been replaced by fake; they have been dethroned and marginalized, expelled from the focus of public debate and political identities in three different but equally radical ways. Colin Crouch defined post-democracy as a political stage that continues to have and to use all the institutions of democracy, but they have become an increasingly formulaic shell. The energy and innovative drive is passing away from the democratic arena into the small circles of a politico-economic elite. In the fluid world of a post-democratic society, things both are and are not themselves. Previously clear-cut phenomena ­– democracy, truth, facts – become void of all content, a shell, an empty symbol. The more of a formality this shell becomes, the easier it is to fill it with contradictory contents, such as electoral authoritarianism or illiberal democracy. In a post-democracy, the truth does not turn into a lie, but the boundary with fake becomes blurry, and the two can easily sink into the penumbra of conspiracy. This emptying out of the contents of democracy is deeply frustrating, and citizens react in three ways: anger and contestation; mistrust of elites; and attempts to fill the now-void shell. Paradoxically, a mistrust of facts seems a healthy attitude towards the authors of the simulacrum that has replaced the world – politicians, experts, public intellectuals. The fluid relations between fact and fake revitalize an old genre: conspiracy. Just as paradoxically, because of its facility in mixing facts and fake, certainties and suspicions, explanations and passions, conspiracy turns out to be an appropriate genre, the only one that undertakes to account for phenomena that have been subjected to a deafening public silence, phenomena that look impossible but are completely real, such as the theft of a dam in post-communist Bulgaria or the theft of a bank ­– not theft from a bank but the pillage of a major bank in Bulgaria. When élites empty democracy of its meaning and leave inexplicable facts floating in public space, citizens have no choice but to fill the void. Conspiracy theories are one such filling. The other two are the aestheticization of exalted identities and rhizomatic networking. During the refugee crisis, Bulgaria entered world media with its vigilantes who ‘hunted’ and ‘arrested’ refugees. Unlike critical international coverage, Bulgarian TV transmuted these perpetrators of physical and symbolic violence into heroes and stars. This political/media episode illustrates three significant trends. One is the utter immunization of the numerous fans of vigilantes and other populist icons against factual discourses – both when it come to data about the decrease of refugee flows and with respect to the principle that the state has the sole monopoly on legitimate violence. The heroic interpretation of citizenship replaces party politics with body politics – bodies rendered heroic. The other trend has to do with a new surrogate of facts and liberal democracy: the heroic revival of the Spartan ideal of citizens as soldiers, as guardians of national identity and its borders, national and symbolic alike. This heroic interpretation of citizenship is extremely appealing to young people, because it replaces party politics with body politics, hollow and dysfunctional institutions with bodies rendered heroic. Paradoxically, media transform real national populists into media images and imaginaries of bad guys, instituted as role models. If vigilantes did not exist, media would have invented them. This is my formulation of the third trend: the Berlusconization of the media and the Herderization of public discourses, where spectacle, provocations, violence are not mere media tools for attracting audiences but political instruments for fundamentally transforming interest- and ideology-based politics into identity politics, for moving away from party politics and toward symbolic politics. Identities can neither be verified nor falsified by facts. The more aestheticized and glorified, ergo symbolically significant, politically influential, publicly all-encompassing identities become, the narrower the impact that facts can have. The Net is evolving from arborescent to rhizomatic networks. Arborescent networks sprout from a common trunk that branches out, each branch sprouting new ramifications. Rhizomatic networks do not have a common trunk; they have multiple hubs and nodes that interconnect or not in various ways. Rhizomatic networks are a powerful mechanism for turning off fact checking. They are the digital version of communities made up of ‘Us,’ where one’s identities and interpretations do not get scrutinized in the critical mirror of facts or other interpretations, let alone different identities. The David of facts will not be able to take on the Goliath of fake in combat unless the political setting for the battle evolves. Rhizomatic citizens perceive themselves to be both right and energized. Rhizomatic networks expand the groundwork for the tweeterization of hate and digitalization of Othering. Digital defeat seems to mark the outcome of the symbolic battle of the liberal Web, aimed at information sharing and citizen empowerment, with the Dark Net of hate, Othering, conspiracy. Facts are weakened in three different, equally powerful ways – political, symbolic, digital. Facts are undermined and destabilized in terms of 1/legitimacy, because produced by élites from whom trust has been withdrawn for transforming democracy and facts into empty shells; 2/symbolic weight in a realm of symbolic politics untouchable by factual verification; 3/ digital irrelevance in the self-checking rhizometric networks. Facts are weakened by both the rise of populism and the conditions that make possible the populist turn. The David of facts will not be able to take on the Goliath of fake in combat unless the political setting for the battle evolves. One way of countering populism is through citizenship – contestatory, solidary, digital, and creative. Youth stands on both sides of populism: they are among the most active and most passionate radical populists; and are among the most active and dedicated champions of human rights, green and solidary values. Populists and Greens are the two major political innovations that have emerged since the second world war. The green ‘future’ is as much a construct as the populist ‘past’, but they are asymmetrically hospitable to facts and fake. It allows rage and contestation to be transformed into a legitimate critique of the irresponsible and corrupt élites who fail to represent. Paradoxically, despite their opposite political messages, the two groups stem from the same ground, structured around three poles: ‘why we hate politics’ or a rejection of ‘politics as usual’; protest as the ‘expansion of conflict’ and the perfect ‘anti-politics’; the Internet in its rebellious and hacker spirit. Combined, I conceptualize this as contestatory citizenship. It has a powerful potential for change. It allows rage and contestation to be transformed into a legitimate critique of the irresponsible and corrupt élites who fail to represent. The critic of the élites is far more willing to welcome facts and fact-checking platforms: Decodeurs of Le Monde in France and True or no of Mediapool in Bulgaria are read with great interest by my students of all political colors. Citizenship means filling the void of post-democracy with citizens’ participation and engagement. A group of Bulgarian journalists, intellectuals, most-awarded artists, top Internet experts have decided symbolically to re-appropriate the city. 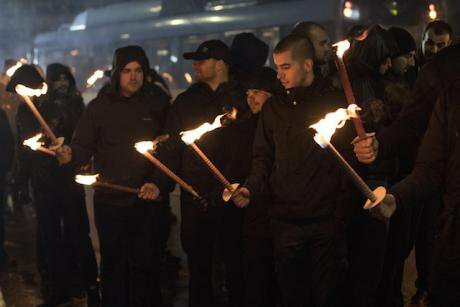 Every February a neo-Nazi march is organized in the streets of Sofia mapping the capital symbolically in terms of radical national populism: the flaming torches at night-fall create a spectacular effect, securing a spot on the prime-time news, and attracting a lot of young fans. Anna Krasteva at the World Forum for Democracy 2017. Council for Europe/ Klara Beck. All rights reserved.How can we reconquer the capital city, symbolically – both in real and virtual terms – to capture the imagination of youth, to reorient it towards creativity, imagination and engagement? I hope to be able to report on the success/failure of the transformative power of citizenship over populism in February 2018. Generation Identitaire’s ‘Declaration of war’. In the 1990s, the dam that supplies water to the capital city of Sofia ended up empty, and not for natural reasons. As a result, Sofia had to implement a water rationing program. No-one has ever been held responsible for this egregious theft. Several examples refer to Bulgarian phenomena; the analysis has a larger validity. Roos J. and Oikonomakis L. (2014) “They don’t represent Us” The global resonance of the real democracy movement from Indignados to Occupy in della Porta D. and Mattoni a. (eds) Spreadig protest. Social movements in time of crisis. Colchester:ECPR Press, 117-136. p. 119. Krasteva A. (forthcoming) Being a citizen in times of mainstreaming of populism: building post-communist contestatory and solidary citizenship in: Siim B, Saarinen A., Krasteva A. (eds) Citizens activism and solidarity movements in contemporary Europe. Palgrave Macmillan. Hay C. (2007) Why we hate politics. Cambridge: Polity Press. Schattaschneider E. E. (1975) The semi-sovereign people. New York: Wadsworth Thomson Learning. Rosanvallon P. (2006) La contre-democratie. Paris : Seuil. The author being one of them.